am Donnerstag, 09.02.2017 ist es endlich mal wieder Zeit für die Schlafplatzorga-Küfa, um 19.00 in der Scherer (Schererstraße 8 – Wedding, U-Bahn Linie 9, Nauener Platz). Referentin am 9.2. wird sein “Neue Kriege”. Dazu laden wir 19:00 Uhr in den InfoLaden der Scherer8 ein, ab 20:00 Uhr kann in der Bar rumgehangen werden. Küfa gibt es ab 20:30. Es wird ein Gericht aus dem Tschad gekocht, da der SoliZweck diesmal der Abschied eines lieben Menschen ist, der in sein Heimatland zurück geht, weil es ihm nicht vergönnt ist in Deutschland eine Arbeitserlaubnis zu erhalten. Damit er sein eigenes Business als Busfahrer gründen kann, müssen wir alle gut essen und SoliSchnaps trinken, damit viel Kohle zusammen kommt! Migrant-led activist group from Oranienplatz in Berlin are now touring the world, or at least some of it. Here to connect the movement across borders, the first stop is London! Gain and share insights and experiences during these events. 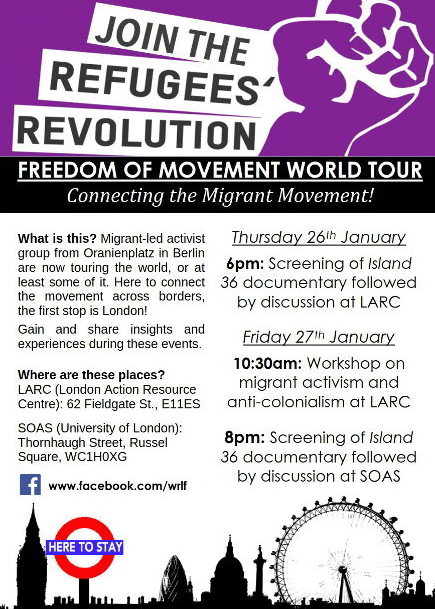 We plan to travel through England, Spain, Italy, Uganda and South Sudan to meet refugees and migrant activists. We want to share our experiences at info panels, workshops and film screenings and build a movement across borders! We are from the self-organised Refugee Movement Berlin that started occupying Oranienplatz in central Berlin in 2012 to demand our rights. Even after the eviction we continue fighting. This is the second transnational refugee tour to make our voices heard! We believe in freedom of movement for everybody, meaning the right to choose where to go and where to stay whenever you want. 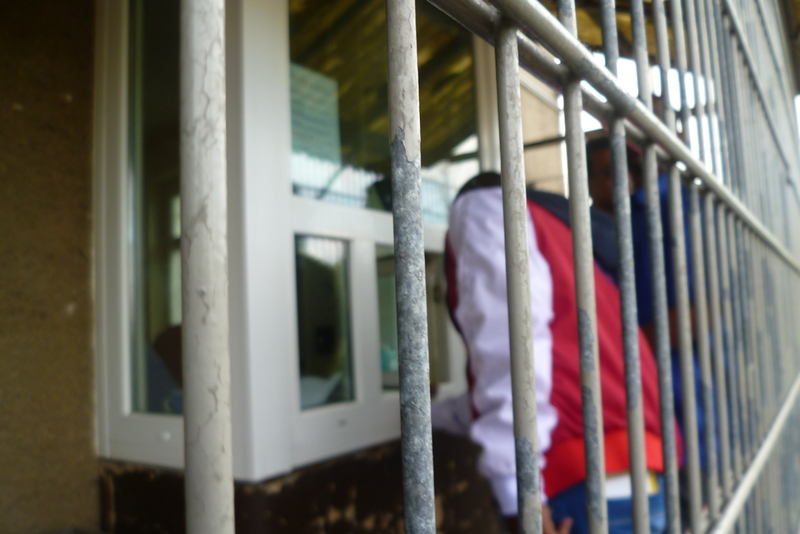 With transnational exchange of ideas we can fight deportation, stop detention, resist being held in refugee camps, end isolation from the communities and throw the fear away! Together we are strong! Donations sustain this activism. Any support you are able to give will be greatly appreciated and wisely used!